BD Vacutainer® CPT™ is a fully-closed system for separation of mononuclear cells from whole blood, where cell separation is carried out in the primary blood collection tube. This decreases the complexity of steps for mononuclear cell separation, thereby minimizing variability from sample processing. CPT™ is an evacuated, sterile blood collection tube containing buffered sodium citrate or sodium heparin anticoagulant, liquid density medium and an inert gel barrier. It is intended for the collection of whole blood and the subsequent separation of mononuclear blood cells for the purposes of in vitro diagnostic examination. Whole blood is drawn directly into the CPT™ using standard phlebotomy techniques and processed in the same tube. During centrifugation, the gel forms a physical barrier between the mononuclear cells in plasma and the erythrocytes and granulocytes. 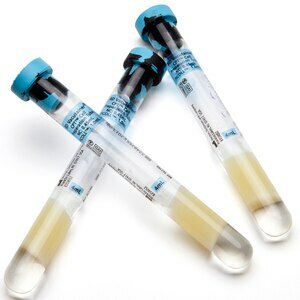 The separated, concentrated suspension of mononuclear cells in plasma can then be transported in the primary blood collection tube. Store BD Vacutainer® CPT™ Tubes upright at room temperature (18-25° C). Protect tubes from direct light. Shelf life at 18-25ºC is one year from the date of manufacture. Azoulay S, Nevers MC, Creminon C, Heripret L, Durant J, et al. Sensitive Enzyme Immunoassay for Measuring Plasma and Intracellular Nevirapine Levels in Human Immunodeficiency Virus-Infected Patients. Antimicrob Agents Chemother 2004;48:104-109. Baechler E, Battliwalla F, Karypis G, Gaffney P, et al. Interferon-inducible Gene Expression Signature in Peripheral Blood Cells of Patients with Severe Lupus. PNAS 2003;100:2610-2615. Balasuriya U, Snijder E, Heidner H, Zhang J, Zevenhoven-Dobbe J, Boone J, et al. Development and Characterization of an Infectious cDNA Clone of the Virulent Bucyrus Strain of Equine Arteritis Virus. J Gen Virol 2007;88:918-924. Becher F, Pruvosat A, Schlemmer D, Creminon C, Goujard C, et al. Significant Levels of Intracellular Stavudine Triphosphate are Found in HIV-Infected Zidovudine-treated Patients. AIDS 2003;17:555-561. Bhattacharya S, Tyagi S, Srisuma S, DeMeo D, Shapiro S, et al. Peripheral Blood Gene Expression Profiles in COPD Subjects. J Clin Bioinformat 2011;1:1-12. Colombo S, Beguin A, Telenti A, Biollaz J, Buclin T, et al. Intracellular Measurements of anti-HIV Drugs Indinavir, Amprenavir, Saquinavir, Nelfinavir, Lipinavir, Atazanavir, Efavirenz and Nevirapine in Peripheral Blood Mononuclear Cells by Liquid Chromatography Coupled to Tandem Mass Spectrometry. J Chromatograph B 2005;819:259-276. Cronin AJ, Aucutt-Walter NM, Budinetz T, Bonafide CP, DiVittore, NA, et al. Low Dose Remifentanil Infusion Does Not Impair Natural Killer Cell Function in Healthy Volunteers. Br J Anaesth 2003;91:805-809. Ehrhardt M, Mock M, Haefeli W, Mikus G, Burhenne J. Monitoring of Lopinavir and Ritonavir in Peripheral Blood Mononuclear Cells, Plasma, and Ultrafiltrate using a Selective and Highly Sensitive LC/MS/MS Assay. J Chromatograph B 2007;850:249-258. Fischer M, Huber W, Kalivroussis A, Ott P, Opravil M, et al. Highly Sensitive Methods for Quantitation of Human Immunodeficiency Virus Type 1 RNA from Plasma, Cells and Tissues. J Clin Microbiol 1999;37:1260-1264. Green LJ, Marker P, Ray C, Cook CA, Jaken S, et al. Development and Validation of a Drug Activity Biomarker that Shows Target Inhibition in Cancer Patients Receiving Enzastaurin, a Novel Protein Kinase C-B Inhibitor. Clin Cancer Res 2006;12:3408-3415. Holodniy M, Mole L, Yen-Lieberman B, Margolis D, Starkey C, et al. Comparative stabilities of Quantitative Human Immunodeficiency Virus RNA in Plasma from Samples Collected in Vacutainer CPT, Vacutainer PPT and Standard Vacutainer Tubes. J Clin Microbiol 1995;33:1562-1566. Hughes A, Mattison J, Western L, Powderly J, et al. Microtube Device for Selectin-Mediated Capture of Viable Circulating Tumor Cells from Blood. Clin Chem 2012;58:846-853. Katial RK, Brandt BL, Moran EE, Marks S, Agnello V, Zollinger W. Immunogenicity and Safety Testing of a Group B Intranasal Meningococcal Native Outer Membrane Vesicle Vaccine. Infect Immun 2002;70:702-707. Mahony J, Chong S, Coombes B, Smieja M, Petrich A. Analytical Sensitivity, Reproducibility of Results, and Clinical Performance of Five PCR Assays for Detecting Chlamydia Pneumoniae DNA in Peripheral Blood Mononuclear Cells. J Clin Microbiol 2000;38:2622-2627. Mole L, Margolis D, Carroll R, Todd J, Holodniy J. Stabilities of Quantitative Plasma Culture for Human Immunodeficiency Virus, RNA, and p24 Antigen from Samples Collected in Vacutainer CPT and Standard Vacutainer Tubes. J Clin Microbiol 1994;32:2212-2215. Pierini M, Dozza B, Lucarelli E, Tazzari P, et al. Efficient Isolation and Enrichment of Mesenchymal Stem Cells from Bone Marrow. Cytotherapy 2012;14:686-693. Ramanathan R, Egorin M, Eiseman J, Ramalingam S, Friedland D, Agarwala S, et al. Phase I and Pharmacodynamic Study of 17-(Allylamino)-17-Demethoxygeldanamycin in Adult Patients with Refractory Advanced Cancers. Clin Cancer Res 2007;13:1769-1774. Rouzes A, Berthoin K, Zuereb F, Djabarouti S, Pellegrin I, et al. Simultaneous Determination of the Antiretroviral Agents: Amprenavir, Lipinavir, Ritonavir, Saquinavir and Efavirenz in Human Peripheral Blood Mononuclear Cells by High Performance Liquid Chromatography—Mass Spectrometry. J Chromatograph B 2004;813:209-216. Ruitenberg J, Mulder C, Maino V, Landay A, Ghanekar S. Vacutainer CPT and Ficoll Density Gradient Separation Perform Equivalently in Maintaining the Quality and Function of PBMC from HIV Seropositive Blood Samples. BMC Immunol 2006;7:1-8. Schlenke P, Klüter H, Müller-Steinhardt M, Hammers HJ, Borchert K, Bein G. Evaluation of a Novel Mononuclear Cell Isolation Procedure for Serological HLA Typing. Clin Diagn Lab Immunol 1998;5:808-813. Shariat S, Gottenger E, Nguyen C, Song W, Kattan M, et al. Preoperative Blood Reverse Transcriptase-PCR Assays for Prostate-Specific Antigen and Human Glandular Kallikrein for Prediction of Prostate Cancer Progression after Radical Prostatectomy. Cancer Research 2002;62:5974-5979. Slawin K, Shariat S, Nguyen C, Leventis A, Song W, et al. Detection of Metastatic Prostate Cancer using a Splice Variant-Specific Reverse Transcriptase-Polymerase Chain Reaction Assay for Human Glandular Kallikrein. Cancer Research 2000;60:7142-7148. Smieja M, Chong S, Natarajan M, Petrich A, Rainen L, Mahony J. Circulating Nucleic Acids of Chlamydia Pneumoniae and Cytomegalovirus in Patients Undergoing Coronary Angiography. J Clin Microbiol 2001;39:596-600. Smieja M, Mahony J, Petrich A, Boman J, Chernesky M. Association of Circulating Chlamydia Pneumoniae DNA with Cardiovascular Disease: A Systematic Review. BMC Infectious Diseases 2002;2:1-10. Tondella M, Talkington D, Holloway B, Dowell S, Cowley K, et al. Development and Evaluation of Real-Time PCR-Based Fluorescence Assays for Detection of Chlamydia Pneumoniae. J Clin Microbiol 2002;40:575-583. Weinberg A, Betensky RA, Zhang L, Ray G. Effect of Shipment, Storage, Anticoagulant, and Cell Separation on Lymphocyte Proliferation Assays for Human Immunodeficiency Virus-Infected Patients. Clin Diagn Lab Immunol 1998;5:804-807. Wu P, McCart A, Hewitt S, Turner E, et al. Isolated Organ Perfusion Does Not Result in Systemic Microembolization of Tumor Cells. Ann Surg Oncol 1999;6:658-663.